Originally posted: December 3, 2018 . Last modified: April 6, 2019 . Soft Sugar Cookies are buttery, sweet, and tender. 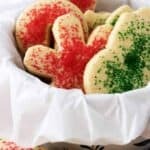 Classic holiday cookies sprinkled with colorful decorating sugars make an easy and fun dessert! These soft sugar cookies were one of Kim’s first published recipes and we felt they needed a little updating. In fact, after trying to recreate the cookies, we realized it was time to start from scratch. So, Kim set out to find a different cookie recipe that she could modify to fit our tastes. She found an amazing one from TheKitchn that she changed, slightly. I invite you to take a look at the original recipe that inspired this post update. Maybe you’ll learn how to make two different kinds of sugar cookies. In the meantime, we hope you give our soft sugar cookies a try! I definitely think you’ll enjoy these soft. chewy. holiday treats. Oh, in case you’re wondering, what makes these sugar cookies soft? Well, it appears the combination of butter and cream cheese help keep these decorative cookies moist and tender. If you’re looking for other treats to make for the holidays, our bourbon caramel fudge, bread pudding with rum sauce, or peppermint bark may be just the thing you’re looking for! First, pull the butter, cream cheese, and egg out of the fridge to soften and come to room temperature. I would recommend doing this at least 1-2 hours before getting started. Next, preheat your oven to 350 degrees F. and line a baking sheet with parchment paper or a silicone mat. As you can see from the pictures, Kim and I favor silicone mats. They are inexpensive and are a breeze to clean. Now, use a hand mixer or stand mixer to beat the butter and cream cheese for about 3 minutes. The mixture should be creamy and have no lumps. Then, add the sugar and mix everything for another 2-3 minutes until it’s light in color. For this step, you want a fluffy looking product that has an, “off-white,” color. After that, add the egg and vanilla, and mix everything together until it’s combined. 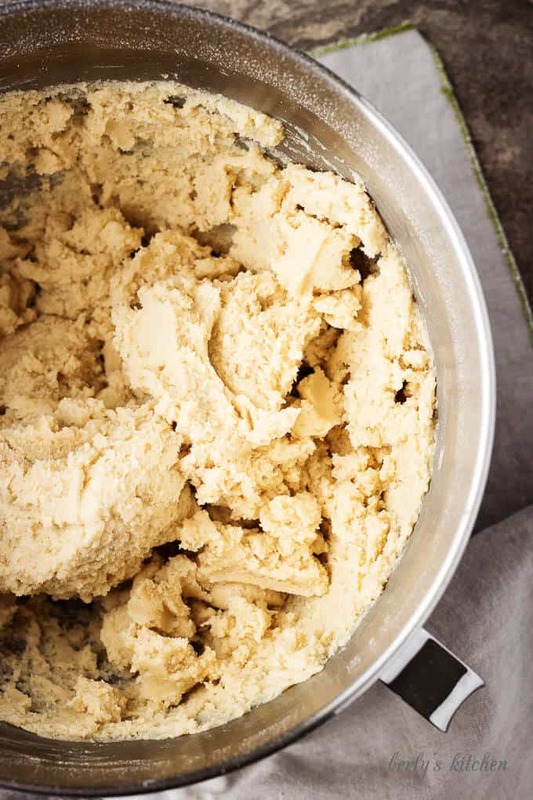 All of this may seem like a pain, but trust me, these few extra steps are critical to making the best soft sugar cookies. At this point, in a separate bowl, whisk together the flour, baking powder, and salt. That’s right, we’re mixing wet and dry ingredients separately before combining them together. Then, carefully add the flour mixture to the wet ingredients and beat until just combined. It’s important not to over mix the cookie dough. Take a look at the picture above as a reference as to how your dough should look. Afterward, form the dough into a ball and wrap it with plastic wrap and place the it in your refrigerator for at least 30 minutes to firm up a little. The refrigeration process ensures that the sugar cookies don’t spread out and become one big cookie pizza when they cook. First and foremost, once the dough sets, place it on a lightly floured surface. Roll out the dough to 1/4 to 1/2 inch thick. 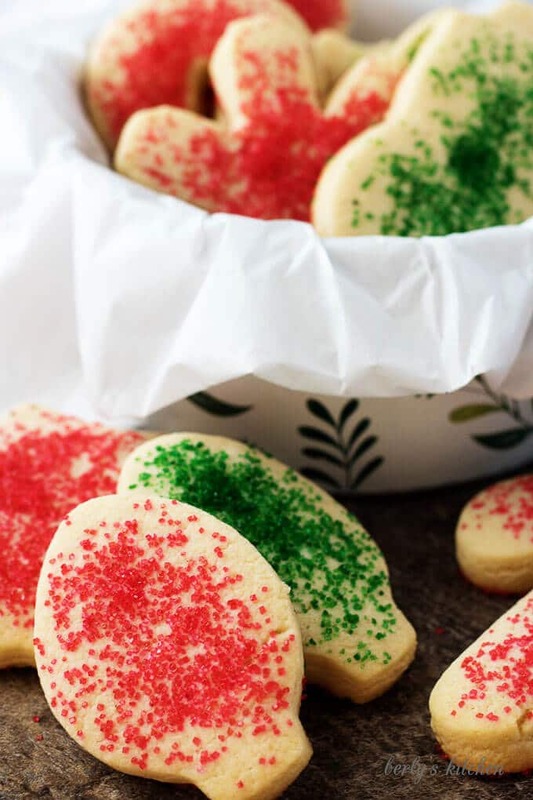 Use festive, holiday cookie cutters to cut out your desired shapes. 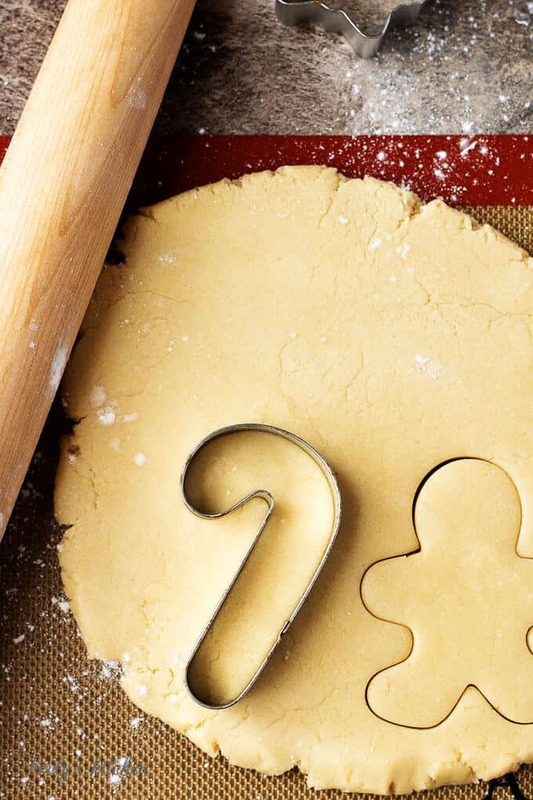 Next, transfer the cookie shapes from your counter to your baking sheet and sprinkle each one with decorating sugar. You can use sprinkles, but I wouldn’t put them on until after you remove the cookies from your oven. Then, bake them for 8-12 minutes. The soft sugar cookies should not brown and be soft to the touch. Now, remove the pan from the oven and transfer the cookies to a cooling rack. That’s it, you’re all done! 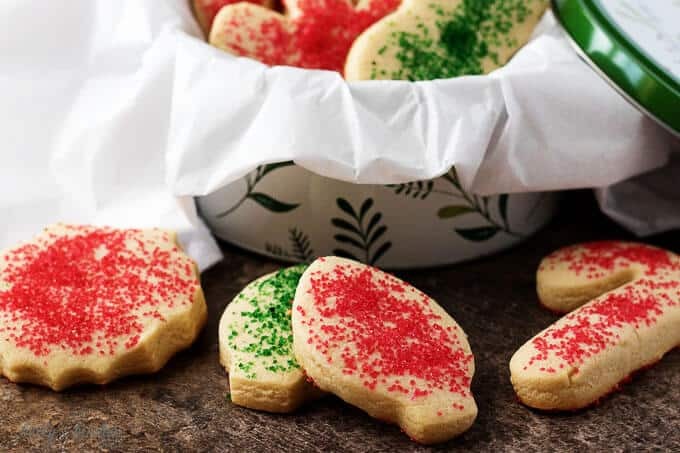 You can serve the soft sugar cookies immediately (after they’ve cooled for a 10-12 minutes) or store in an airtight container for 4-5 days. Kim and I hope you enjoy this post and as always, look below for helpful information and tips. If you forget to pull your butter and cream cheese, or if they’re not softened when you get started, simply use your microwave on it’s lowest power to soften them. We use level 1 for 10-15 second intervals until the butter is soft, but not melted. Also, be sure to cover them with a paper towel, occasionally, they will, “pop,” in the microwave and it can get messy. You can prepare the dough in advance and freeze it. Just make sure to thaw it in your fridge for a few hours before getting started. For a sweeter version, skip the decorative sugar and try using frosting on the cookies after they cool completely. Personally, I like a butter cream or cream cheese based frosting but, that’s up to you. 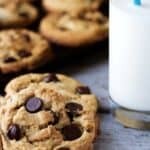 Refrigerating the dough helps keep the cookies from spreading out while cooking. Unless you want a cookie pizza, don’t skip that step! The easiest way I’ve found to cut cookie dough is to cut each cookie. Then, once you’re all done, peel away the excess dough. Transfer the cookies from the counter to your sheet, then form the excess dough into a ball, roll it out again, and repeat the process until all the cookies are cut. 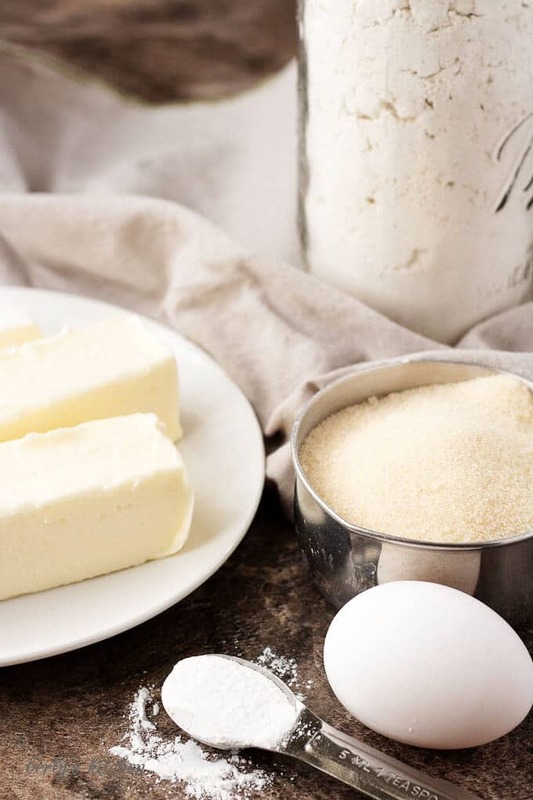 First, remove your butter, cream cheese, and egg from your fridge and allow them to soften and come to room temperature. Next, preheat your oven to 350 degrees F. and prep a cookie sheet or a silicone mat. Then, add the egg and vanilla and mix until combined. Afterward, in a separate bowl, whisk together the flour, baking powder, and salt. Carefully add the flour mixture to the wet ingredients and beat until just combined. Now, form the dough into a dough and wrap with plastic wrap. Place in the refrigerator for at least 30 minutes. After the dough sets, place on a lightly floured surface and roll out to 1/4 to 1/2 inch thick. 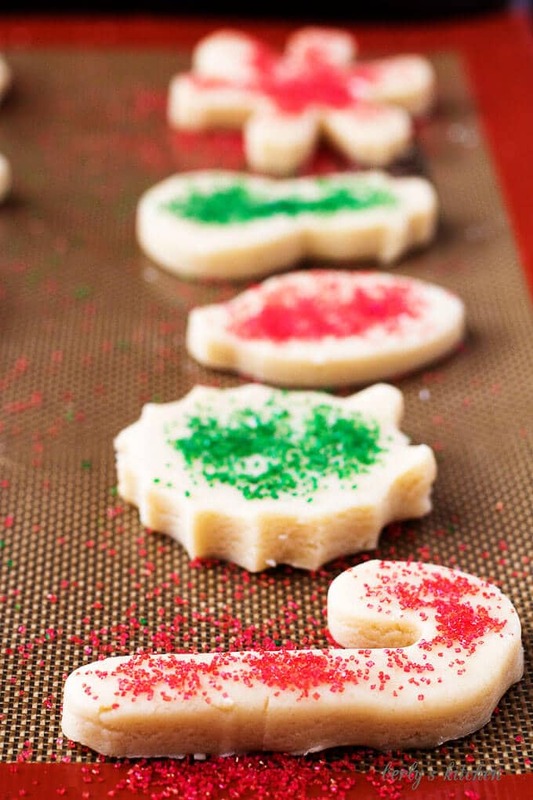 Use cookie cutters to cut out desired shapes and sprinkle with decorating sugar or sprinkles. Last, bake for 8-12 minutes. Remove them from the oven and transfer to a cooling rack. Serve immediately or store in an airtight container for 4-5 days. 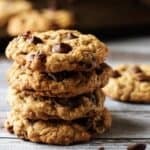 The calories listed are an approximation based on the ingredients and a serving size of one cookie. Actual calories may vary. The cookies can be stored in a sealed container for up to five days. We agree, thank you for commenting!